The purpose of this atlas is to provide information on haulout sites for harbor seals, Steller sea lions, California sea lions, and northern elephant seals located in Washington waters. Locations are provided in order to conduct assessment surveys as well as identify important sites used by these species relative to potential sources of disturbance, development, and other uses of Washingtonís marine environment. This atlas divides the various marine waters of Washington into survey regions which are based on the timing of harbor seal pupping seasons in different marine areas of Washington. Locations of haulout sites were mapped for sites which have been identified during aerial, ground and boat surveys conducted by personnel from the Washington Department of Fish and Wildlife, National Marine Fisheries Service and Cascadia Research Collective as part of ongoing assessment efforts for these pinniped species in Northwest waters. Maps were produced in encapsulated postscript format using Arc/Info, revision 7.0.4 GIS software developed by Environmental Systems Research Institute (ESRI). The maps are projected in Washington State Plane South Zone, Datum NAD27. The latitudes and longitudes listed in the tables and appendices are likewise in Datum NAD27. Haulout sites were digitized using the ESRI GIS software from USGS 7.5 minute quadrangles with several exceptions. In British Columbia, the Vancouver Island, Gulf Islands, and Race Rocks sites were digitized from NOAA Chart 18400 at a scale of 1:200,000. The sites located around the mouth of the Fraser River, Roberts Bank, Boundary Bay and Mud Bay were digitized from 1:50,000 scale Canadian quadrangle maps. Buoy sites in Puget Sound were digitized from NOAA Chart 18440 at a scale of 1:150,000. The digital base maps came from a wide variety of sources. The Washington State shorelines were produced by the Washington Department of Natural Resources (DNR) at 1:24,000. The British Columbia shoreline at a scale of 1:2,000,000 was produced by the BC Ministry of Environment, Lands and Parks. The Oregon coast shoreline at a scale of 1:100,000 was supplied by the Oregon State GIS Service Center. Mudflats and sandbars were derived largely from the National Wetlands Inventory (NWI) database. Some areas were updated using USGS 7.5 quadrangle maps and 1:50,000 Canadian quadrangle maps. Columbia River mudflats and sandbars were enhanced using data derived from the Washington River Information System (WARIS) developed by the Washington Department of Fish and Wildlife and Bonneville Power Administration. U.S. Fish and Wildlife Service site codes were used as necessary to identify rocks and islands in the Washington Islands and San Juan Islands National Wildlife Refuges. Jeffries, S.J., P.J. Gearin, H.R. Huber, D.L. Saul, and D.A. Pruett. 2000. 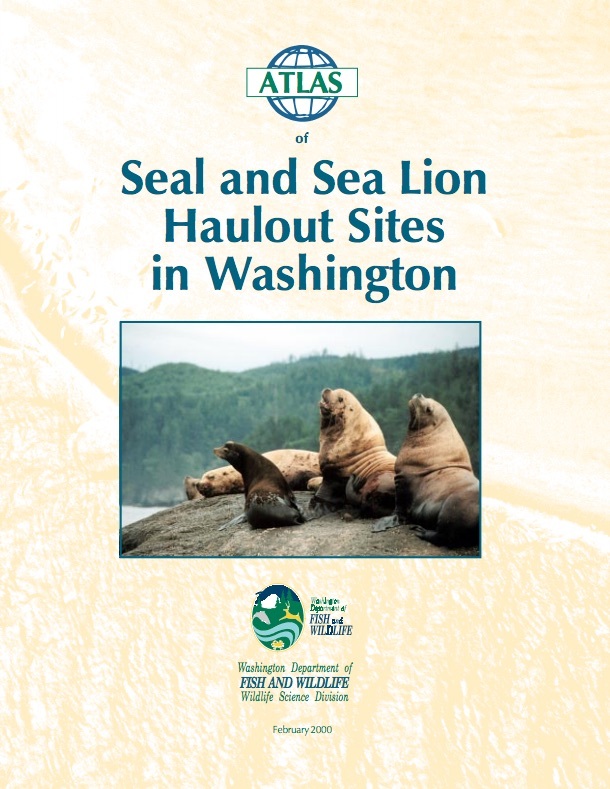 Atlas of Seal and Sea Lion Haulout Sites in Washington. Washington Department of Fish and Wildlife, Wildlife Science Division, 600 Capitol Way North, Olympia WA. pp. 150.